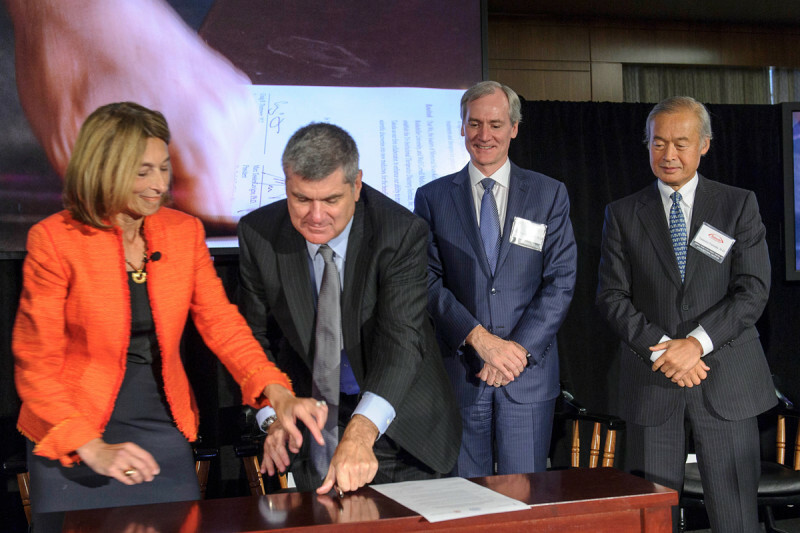 (From left) Weill Cornell Medical College Dean Laurie Glimcher, Memorial Sloan Kettering President Craig Thompson, and The Rockefeller University President Marc Tessier-Lavigne formalize the Tri-Institutional Therapeutics Discovery Institute and its partnership with Takeda Pharmaceutical Company, represented by Director Tadataka Yamada (far right). Memorial Sloan Kettering is joining with two other academic institutions in a pioneering collaboration to speed early-stage drug discoveries into therapies for patients. Despite tremendous advances in medical research in recent decades, the number of new treatments that become available to patients each year is stalled at historically low levels. All too often, promising ideas in the laboratory fall into the “Valley of Death,” a term drug developers use to refer to the funding gap between basic discovery and clinical testing. Now, in a pioneering collaboration, Memorial Sloan Kettering is partnering with The Rockefeller University and Weill Cornell Medical College to form the Tri-Institutional Therapeutics Discovery Institute, Inc. (Tri-I TDI). The institute has been designed to accelerate early-stage drug discoveries into innovative treatments and therapies for patients with various diseases, including cancers. Memorial Sloan Kettering, The Rockefeller University, and Weill Cornell Medical College have announced that they have formed the pioneering Tri-Institutional Therapeutics Discovery Institute, Inc. and have partnered with Takeda Pharmaceutical Company, Ltd.
Tri-I TDI will focus on the early stages of developing compounds through “proof-of-concept” studies that suggest that targeting a biologic pathway has potential to favorably alter the course of a disease. The institute has also engaged the Takeda Pharmaceutical Company as a first collaborator to help develop small molecule drugs. The institute — a new model of academic-industrial collaboration — officially launched on October 1 and will select research projects that hold the greatest scientific promise and present the most innovative hypotheses. The participation of Takeda, a global pharmaceutical company based in Japan with a strong record of bringing new medicines to market, will benefit drug discovery work at the three academic institutions. Each scientist’s home institution will retain its intellectual property. Memorial Sloan Kettering has several existing collaborations with Weill Cornell Medical College and The Rockefeller University to advance basic biological research, foster stem cell research, and coordinate cancer research efforts. The Tri-I TDI is taking a novel approach by partnering with a pharmaceutical company, whose medicinal chemists and pharmacologists will be working alongside academic scientists from the earliest stages of drug development. Tadataka Yamada, Director and Chief Medical and Scientific Officer of Takeda, said he learned valuable lessons during the time he headed the Global Health Division at the Bill and Melinda Gates Foundation. Among these was that “partnership is an easy word, but there’s an old African saying that if you want to go fast, walk alone. If you want to travel far, walk together. True partnership involves equal sharing, without concern over profit, property, or recognition. In the Tri-I TDI, the rewards will go to groups of people who will work together as colleagues. The independent, nonprofit Tri-I TDI will reflect the myriad interests of the member institutions’ faculty and will bring together their diverse and complementary expertise and resources to address not only the world’s most deadly afflictions but also neglected or “orphan” diseases that affect small numbers of people and receive scant research funding. “An exciting aspect of this program is that it will allow us to focus efforts on these very lethal diseases for the first time and get drug company involvement to develop therapies for them,” Dr. Scheinberg adds. The Tri-I TDI’s initial focus, says Dr. Scheinberg, will be to develop small-molecule therapies for cancer, infectious disease, cardiovascular and metabolic disorders, inflammatory diseases, and neurodegenerative disorders. In the next several years, the program’s scope will expand to include monoclonal antibodies, which are increasingly being used for cancer, inflammation, and infectious diseases, and to begin making a new generation of molecular imaging agents to improve diagnosis. thanks to all for hard work you all do to help others. WE MUST ALSO LOOK AT MODIFING THE PATENT LAWS INREGARDS TO DRUGS. [1.] THE LENGTH OF TIME A PATENT IS HELD SHOULD BE LOOKED INTO. THIS WOULD SPEED UP THE TIME FOR GENERICS TO BE MANUFACTURED AND GET INTO THE MARKET PLACE. [2.] I SUGGEST THAT ONCE THE RESEARCH AND DEVELOPMENTAL COSTS HAVE BEEN REPAID THAT THEN A DRUG SHOULD BE AVAILABLE FOR GENERIC MANUFACTURING. Agree wholeheartedly. It amazes me how a new promising cancer treatment is side-lined to facilitate profit making for the patent period even though the patented treatment is often inferior. That is a great concept, if all drug development dollars were successful in generating a positive drug for patients and was profitable. What do we do to fund the majority of the development risks that failed to be clinically positive? Without an answer there, there will be no investment in this type of of cutting edge research.